Mobile digital technology brings a handy Husker Harvest Days app designed to help visitors and exhibitors plan and keep on top of show features before and during the event. Husker Harvest Days always places new technology center stage and the new Husker Harvest Days app offers a wealth of show information by using the latest technology for smartphones and additional app-compatible hardware. The app is free to download from the Apple and Android app markets. 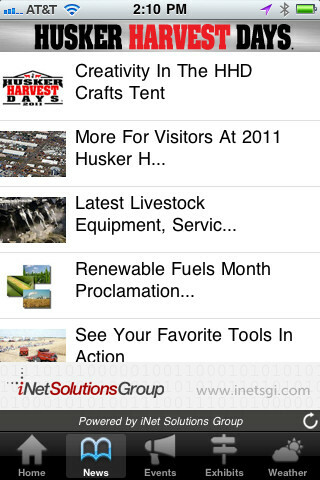 From locating exhibitors to show traffic updates, the Husker Harvest Days app takes users on a tour of the show and presents easy access to the latest show information. Keep up on the latest show news with the new Husker Harvest Days App for Android and iPhone. Show information is presented in easy-to-navigate tabs, and users can easily move about the app, collecting exhibitor information, planning treks, reading the latest show news…and more. The app is free to users from Husker Harvest Days, the world’s largest totally irrigated working farm show. While the app is free, your usual phone usage charges apply. 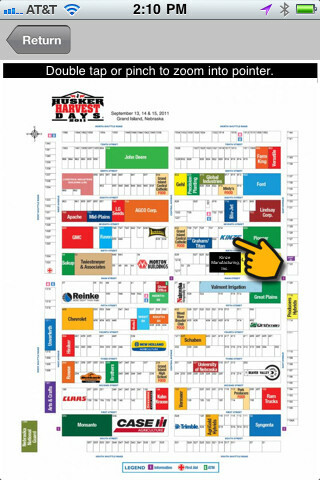 Locate specific exhibitors using the mobile mapping tool in the Husker Harvest Days App. Android and Apple versions are available now in the Android Market and the Apple App Store respectively. Locate the app in either marketplace by searching for "Husker Harvest Days." Farm Progress developed the app in conjunction with iNet Solutions Group Inc., its Omaha, Neb.-based digital development partner. While the Husker Harvest Days app is Farm Progress’ latest digital introduction, the company continues to lead the ag media industry with its exclusive array of apps. The innovative feature-filled Farm Progress Growing Degree Days mobile app was introduced in 2010 with great success, followed by apps for Farm Futures magazine and the Beef Producer section; the Farm Progress app that encapsulates local news and information for each of its 18 Farm Progress state and regional publications; and the Farm Progress Show app. The company develops custom apps for clients, as well. Each new product introduction and upgrade has experienced enthusiastic acceptance and success. The company’s aggressive digital initiatives include its 18 state and regional magazine websites (accessible via FarmProgress.com), FarmFutures.com, BeefProducer.com, FarmProgressShow.com, HuskerHarvestDays.com and additional show websites, and its broadcast companion website, FarmProgressAmerica.com. Its mobile Web access for its publications and largest shows were the first in the industry. Farm Progress’ portfolio of digital services underscores the company’s industry leadership position. It's all part of Farm Progress' position as the industry's Agricultural Information Leader.